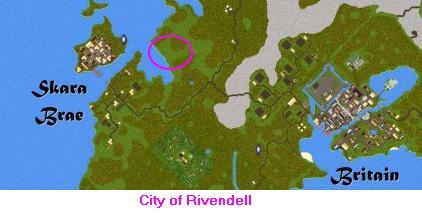 Rivendell is one of the most complete and sponsored towns I have seen. It has an excellent Tavern with furniture locked down. Extensive Landscaping, and a town hall that has been locked down. The GMs have even gone so far as to place rocks around the town so that houses can’t be built. The city has a rune library, many open shops, and a friendship tower. The original mayor of Rivendell was Tavis. I belive that a new mayor has been appointed. His name is Redrum.